Today marks 5 day until my vacation and I’ve been making sure that I continue to eat healthy in order to meet my weight goals. This morning I had some leftover steak for breakfast with my eggs, which is one of my favorite breakfasts to have. You can see the picture I took this morning to the right. I used just about a full carton of egg whites (8 egg white carton), 1 whole egg, and about a piece of steak the size of my fist cut up in squares and fried on the stove with virgin olive oil. 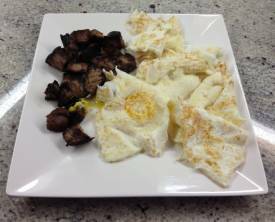 Steak ‘n eggs are a great low carb, high protein breakfast for anyone trying to lose fat. I used to eat breakfast potatoes with my eggs in the morning, but since I’ve been cutting for my vacation I’ve switched the potatoes with another source of protein (usually turkey bacon but sometimes steak). I find that starting the day off with a low carb breakfast sets the tone for the day, and I haven’t seen any decrease in energy levels since doing so (I’ve just made sure that I get in a lot of post workout carbohydrates in the afternoon). I cut my carbs to pretty much nothing for breakfast when I’m serious about losing weight, but I’m sure many people would see some results just by focusing on cutting carbs and adding protein. Try having 4 egg whites, 1 whole egg, and one piece of toast. That will be much better then cereal and milk if you are trying to lose weight. And if you are really serious about losing weight you can substitute the toast for turkey bacon or steak. Besides the breakfast I already talked about so far I’ve had my post workout carbohydrate shake, my protein shake with natural peanut butter and a banana, and for dinner a pork chop with spinach on the side (and franks red hot sauce for taste). Tonight my snacks will be some fresh fruit and a hard boiled egg white or two. My workout today was a lower body/core workout and it was a good one that consisted of a lot of super sets. Included in the exercises today were trap bar deadlifts with box jumps, stiff leg deadlifts with split squat jumps, backward lunges with front kicks and leg swings, hamstring curls, leg extension with calf raises, leg raises for lower abs, and then ball rollouts. The best part of today was my weigh in. If you read my February goals you know that my goal was to get to 195 for my trip. Well today was my first time weighing under 197 and I weighed in at 195. So basically I am at where I want to be, but I just need to keep it clean until the trip. I have a cheat night tomorrow with my girlfriend party which will = food + beer, but I need to make sure I eat well Saturday and hit the gym hard Sunday and Monday. I probably won’t be writing another post until Sunday or Monday. Have a good weekend!